Ambitious, extravagant, progressive, and sexually notorious, Galeazzo Maria Sforza inherited the ducal throne of Milan in 1466, at the age of twenty-two. Although his reign ended tragically only ten years later, the young prince's court was a dynamic community where arts, policy making, and the panoply of state were integrated with the rhythms and preoccupations of daily life. 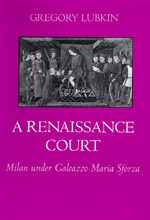 Gregory Lubkin explores this vital but overlooked center of power, allowing the members of the Milanese court to speak for themselves and showing how dramatically Milan and its ruler exemplified the political, cultural, religious, and economic aspirations of Renaissance Italy. Gregory Lubkin has taught at Wellesley College and the University of California, Berkeley, and has authored numerous publications on Renaissance Milan.